These outfits are actually from last weekend, worn during my trip to Thessaloniki. Packing for that trip was a matter of luck. I misread the departure time on my bus ticket and ended up having to pack in less than 5 minutes, in order to make it on time. Clothes were literally flying across the room into my suitcase. But it was a rather fun challenge once I got there, trying to figure out what outfits I would be able to put together out of that mess. Purple dress, long gray cardigan, purple and cream fringed scarf, BERSHKA. Gray cotton-blend tights, CALZEDONIA. Brown leather boots, WONDERS. Gray crown print t-shirt, ZARA. 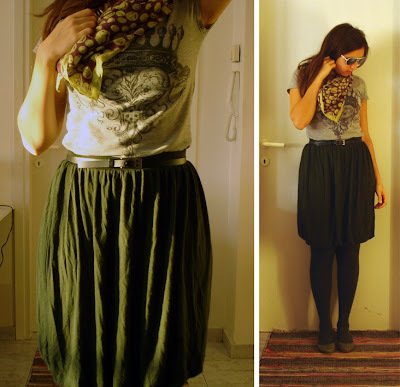 Forest green bubble skirt, refashioned out of a BERSHKA dress. Smiley-face print scarf, PULL AND BEAR. Black belt, came with ZARA top. Gray cotton-blend tights, CALZEDONIA. White rimmed sunglasses, VON ZIPPER. Gray ballet flats, PULL AND BEAR. Gray crown print t-shirt, ZARA. Wide leg jeans worn rolled up, MANGO. Black trench coat, ZARA. Black jersey scarf, ZARA. Brown leather belt, ACCESSORIZE. Dark blue beanie, BERSHKA. Gray ballet flats, PULL AND BEAR. they all look perfect, comfy but stylish! All the outfits are great but the second one is definately my favorite! It's brilliant! 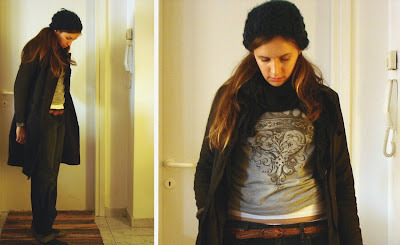 I love how you've mixed the t-shirt with this scarf! Cute outfits - all of them! το φουλάρι στο δεύτερο σύνολο είναι p&b? αγόρασα φέτος ένα σχεδόν ίδιο από ζάρα! Ναι, από τα Pull And Bear αλλά αγορασμένο πρόπερσι. Είναι το αγαπημένο μου, μακάρι να μπορούσα να πάρω άλλα δυο-τρία για καβάτζα! Πότε πήρες το δικό σου από τα ZARA? Λες να το προλάβω? πριν από 2 βδομάδες περίπου.πιστεύω θα το βρεις. σε δύο χρώματα υπήρχε : μάυρο με λευκές φατσούλες και μαύρο με μωβ φατσούλες. Ευχαριστώ Φοίβη! Αν το βρω, θα σου αφιερώσω ποστ. Το μόνο που μένει είναι να κατέβω επτέλους Αθήνα! those came out really cute. Nice outfits. My favorite has to be the first one. Nice to know there was a positive to your packing dillema. you don't need me to tell you that I love that urban feeling of your outfits. just a tip: when packing, I always save time, by picking my coat first and then choosing only the clothes of the same color. at least it's practical! i really like all of these outfits but especially the second one - love that skirt!! Wow, you did incredibly well for a 5-minute pack job! Love them all. Great outfits. The first one is my favorite. I must say, I already miss the weather in Greece!